Hello again! I don’t know about you guys, but I found that I started to get a bit bored with painting troops in the same format, over and over, so I decided to do a few Elite slot entries in between the other jobs. 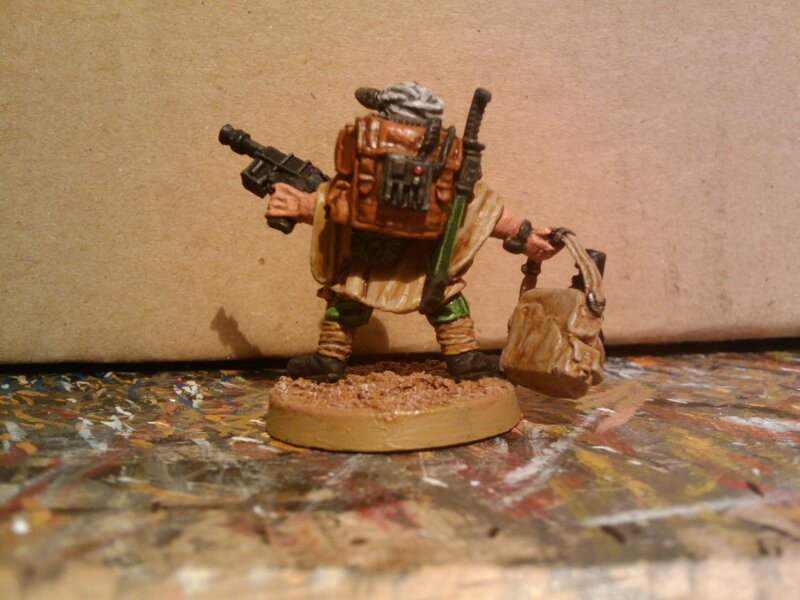 I find that Elites are good fun – they are usually small in number, they have plenty of scope for conversion, and they are great for breaking up a larger project. “Lawrence is the son of a petty under-hive crook who was murdered as part of a long-standing gang feud. His mother fled to the ash wastes with her infant son to escape further retribution, and Lawrence developed a fierce independence and a wide range of survival skills while growing up amongst the desert nomads. By adulthood, Lawrence had developed into a fierce, silent and efficient warrior, and in keeping with the desert traditions, set about avenging his father. He sneaked back into Hive Victoria, and set about systematically eliminating the gangs that he held responsible for the murder, with a cold and brutal approach. The size of the task presented a problem – there were too many to kill individually, but Lawrence had certain flair with explosives… Unfortunately, while effective, the violence unleashed was of such scale that the hive authorities took notice. After several weeks, Lawrence had completed his mission – both gangs responsible for the killing were dead, but unknown to Lawrence, the net cast by the authorities was drawing ever tighter. Inevitably, he was captured while attempting to escape Victoria. 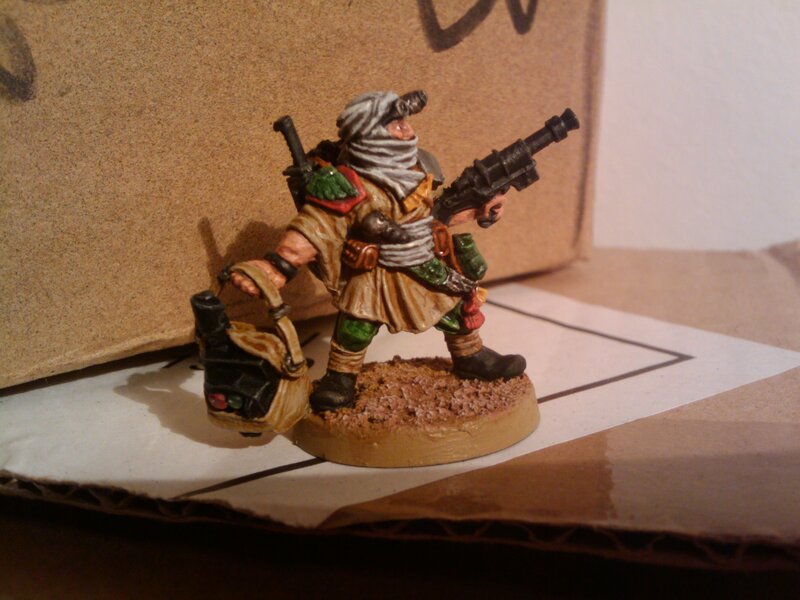 I’ve been looking for a Marbo (Cheap one) for aaaaages! I feel a little ashamed that it wasn’t too long ago that I figured out his name was an anagram of Rambo haha. Your conversion looks very cool mate. 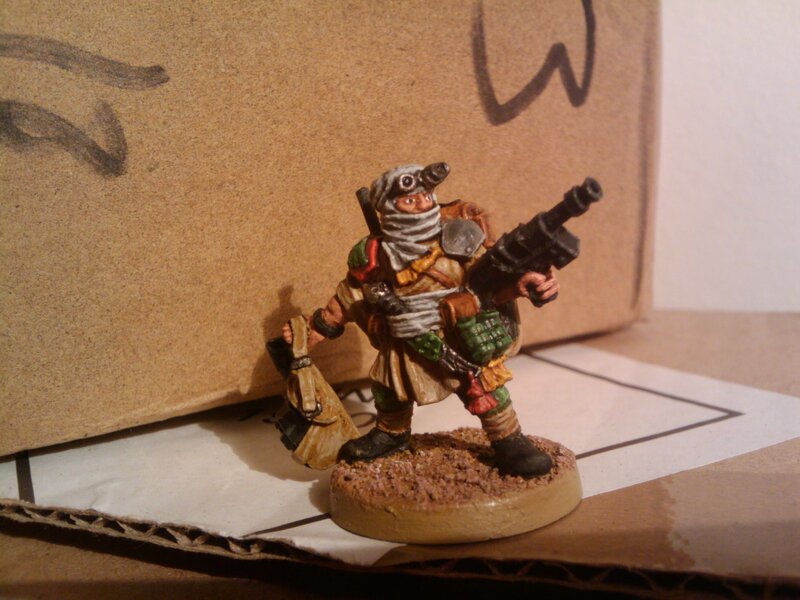 Very Tallarn.